Earth, with some MSG added | Watts Up With That? 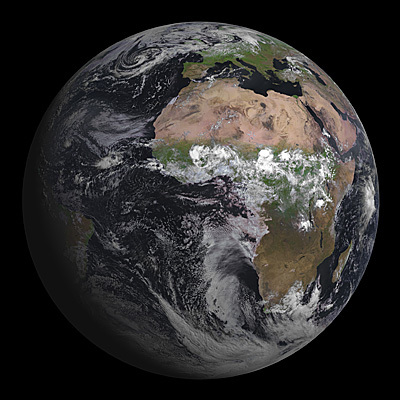 MSG-3 first image of Earth, acquired on 7 August 2012 by its Spinning Enhanced Visible and Infrared Imager (SEVIRI). Click to download a large image, the detail is stunning. I cannot see any detail in this image that is definitely attributable to humans, though it looks like there’s a large source of smoke in southern Libya – which could be natural. Not even any obvious contrails. Anyone else seen something we’ve done? A superb image. 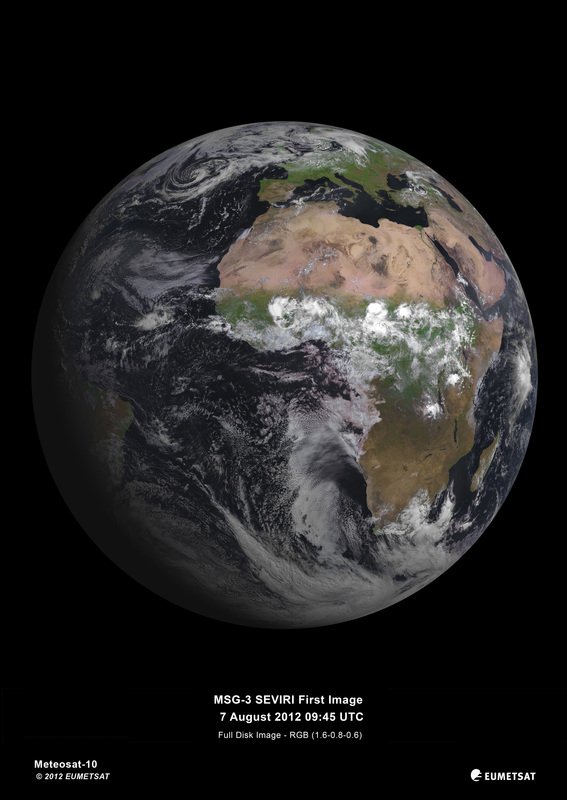 Unfortunately, being geostationary, this is the only angle it will ever see. Wow. It really picks out the greenery. The Okavanga delta in Botswana really stands out. 1 Km pixels is impressive resolution for a global scan, the future appears to be arriving faster these days. Good to see they can get something right. The European space industry is full of what ifs and maybees, first of which is what if the UK hadn’t scrapped the budget for launchers just at the wrong moment. Maybe this satellite would have gone up on a British rocket and Dan Dare would be on Mars. @steveta_uk: The Aswan Dam with Lake Nasser can bee seen. Definitively attributable to humans. How about the lakes behind the Nile dams? One of the first things it would have seen is a very rare snowfall in Johannesburg. No doubt this event was predicted by the global warmers…. If you zoom onto the same area using Google Earth, it is also visible. It appears to be effect of some kind of a darker sand, possibly due to the surface tar. Interesting to note the change in cloud cover along the equator between land and sea surfaces. It’s called ‘ground truthing’. You use the appropriate instruments to measure precisely the relevant variables at chosen points on the ground, and then calibrate/adjust the satellite’s remotely sensed data to match if there is sufficient deviation to warrant it. Now all they have to do is avoid any temptation to run collected data through the super computer over at the Met Office. I forget the highest latitude visible from geosync orbit, but several degrees worth are viewed too obliquely to be useful. Hey! It’s not our fault that Europe is stuck to Asia! Oh sorry, the better response is “Africa sure looks a lot bigger than Europe.” Perhaps someone can remap the image to a Mercator projection. When you say “MSG” we think Monosodium Glutamate, Earth as a full bowl of Chinese noodles. And why not? I think the 1 km resolution might be to blame for that – although a contrail may be several kilometres in length, its width would be too small to be resolved. The same would go for structures, and I think the best we could hope for would be large conurbations appearing as different colours. It’s like we don’t exist, for all of the effect we’re having :). Love the clouds over Africa. Where there are clouds it’s green. Where there are no clouds it is brown. Amazing image – the Waw An Namus volcano in Libya stands out like a wind sock. The prevailing winds of north western Africa are clearly painted from there all the way to the mid Atlantic ocean. It looks too like the snows of South Africa are visible. The Great Rift sprawls across the eastern desert like an ugly scar and the shade-loving coffee plantations of Ethiopia lay beneath a cooling cloud layer. What an excellent first image. I agree. And while there are some features we know are human made, like the Nile dams, and the cities along the Mediterranean coast which are just smudges in the image, if you didn’t know already, could you tell? Impressive detail. I hope the scientific data gathered does not get messaged and mangled like all the rest of the weather data has. Note that the Arctic region is mostly cloud covered and not ingesting extra calories and converting them to (sorry) – not absorbing an extra dose of energy because of a lack of ice cover on that very northern ocean. Thank you for the information Ben, although since the satellite is presumably measuring radiation at the top of the atmosphere I still don’t see how that can be measured by ground-based instruments. Possibly the sensor was set up my using known absolute values before launch. It will still be tricky to check instrument drift though, and regular calibration checks will be impossible. Looks like a lot of white cloud cover causing albedo. Nothing to see here, just move along. “South African Weather Service records show it has snowed in Johannesburg on only 22 other days in the last 103 years. The last snow fell there in June 2007. I didn’t see this on the recent proofs of global warming and extreme weather. The Sahel looks pretty green too, pretty much right up to Lake Chad. Wow, where is the sceptism now? Usually whatever climate scientists do, it’s wrong because of worldwide conspiracy spread by universities physics departments and climate research institutes. Surely the only purpose to launch this piece of research equipment into skies was to provide false data about the atmosphere also in future, just for the fun of irritating you who know better. For what I’ve read posts here at WUWT, that is exactly what people are going to argue when the data won’t fit their perspectives. And I’m sorry to tell you, it won’t. But I have to agree with you in one thing, it is an amazing picture. What a beautiful planet we live on! Good data is the friend of Science and the enemy of CAGW theory. This satellite, provided its data is not “adjusted”, looks promising for those of us who want real science, not Post Normal Science. There sure is a lot of cloud cover on Planet Earth. Could someone explain to me again that clouds don’t have much effect on the amount of solar radiation reaching the Earth’s surface? Is your comment a puzzle where we try to determine what you are trying to say? I can’t seem to solve it. You’re welcome David, …yes, it’s still the same principle so far at atmospheric sounding goes, airplanes equipped with the appropriate instruments measure the relevant parameters at the appropriate altitudes to check against the remotely sensed satellite data for accuracy..
And yes, the satellite sensors at launch are designed to accurately measure the relevant parameters, but post launch acceptance testing and calibration if necessary is carried out to ensure it meets design specifications. And yes again, there most probably will be some sensor drift and other anomalies occurring over the operational life of the spacecraft so these are addressed by recalibration as necessary. Awesome image! The detail is superb, almost like looking at an HDTV image (I know the resolution must be greater than a typical HDTV, but what else can I compare it to?). We need one of these satellites for North and South America. Nothing against physics or meteorology. You just have to get out more. Look around. Stare in wonder at that image and ponder WTF that thing is in the Indian Ocean off Somalia. Fractals ain’t gonna model that yet. Departmental culture gets dissociated from reality and leads to a condition commonly known as having your head up your maths. The false color becomes apparent when comparing against other sat imagery. Note, for example, Israel looks brown and dead while the Nile delta is green and lush. In fact both areas have about the same density of green, neither of which are as green as shown. for America of being “the standard go to source” for forecasts. If the notion was written by Joe Bastardi or other contributor, my apologies up-front. Balancing out the current hot summer in the Eastern 2/3 of the US is the North Atlantic, which is not having a summer at all. Look at the active weather pattern covering the entire thing. 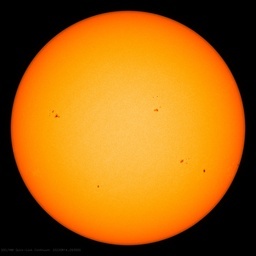 The pic remids me of an old (iconic I guess) NASA still I saw that my dad had. Plus ça change.. as the Europeans say.